Use this code to save $100 off your mattress purchase of $495 or more. This discount can't be combined with any other offer. Tomorrow Sleep offered us an opportunity to review their new hybrid mattress. We were genuinely excited to give Tomorrow Sleep a try. A real memory foam and coil hybrid under $1,000 sounded too good to be true. The fact that it was produced by Serta, makes Tomorrow Sleep a really intriguing mattress. 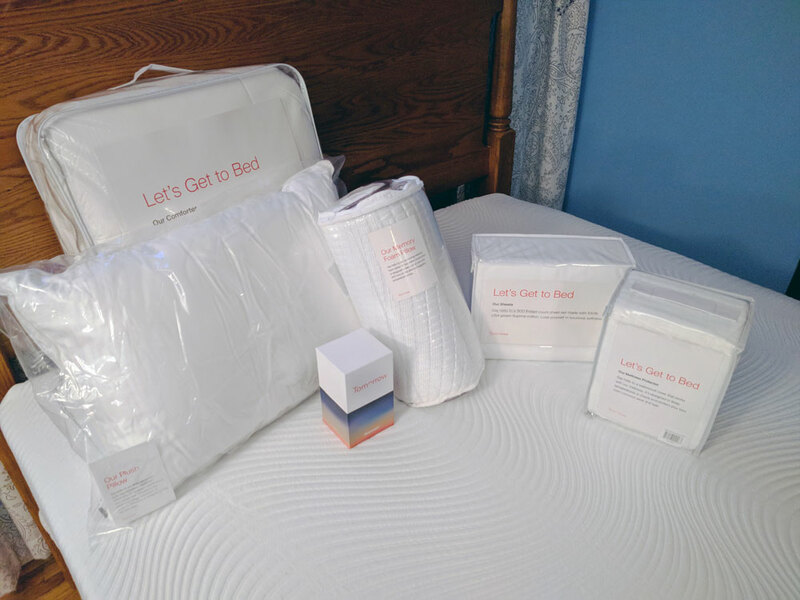 When Serta Simmons (the largest bedding manufacturer in the world) decides to get into the bed in the box industry, we couldn’t help but take notice! The Serta Simmons Co. has already produced a super successful line of hybrid mattresses. Tempur-pedic, Stearns & Foster and Sealy have also introduced similar products. How does this value priced, online option compare to these prominent retail mattresses? We’ll take you through every step of our Tomorrow Sleep experience. The cover has a simple and modern design. Online bedding sales initially appeared to be dominated by foam mattresses. The ability to ship these beds rolled in a box for easy delivery was a distinct advantage. Great price points and convenient, risk free purchase prompted an industry explosion. However, many seeking the support and comfort of an innerspring were left underwhelmed with online options. The challenge, to combine the price point and convenience of online shopping with a quality sleep experience. Tomorrow Sleep founder, Bryan Murphy, with the backing of Serta Simmons, feels they have done just that. Tomorrow Sleep operates as a separate, unique division but, with the full backing of Serta Simmons resources and expertise. There is a small but growing contingent of companies producing online coil spring offerings. Few, if any can claim the consumer respect and confidence of Serta Simmons. But how could a quality coil spring be rolled into a box? The term “hybrid” is one of the most abused phrases in the bedding industry. The definition is actually very simple. “Something that combines two different components, performing the same function”. This usually results in an enhanced final product. If you push the envelope, that definition could apply to almost every mattress made. For example, any foam with coil, or any two foams combined would qualify. In today’s market, you actually will see manufacturers take this liberty. When the term was first introduced in the industry its usage was much clearer. 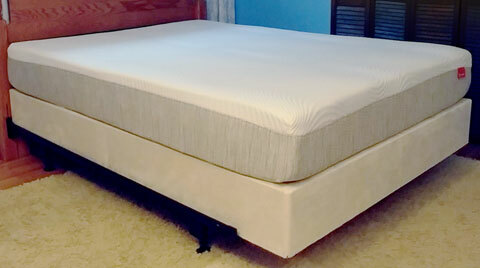 A hybrid was a mattress that combined a pocketed coil with a high quality specialty foam. This being either memory foam or natural latex. Following its original meaning, Tomorrow Sleep is a true hybrid with 3″ of high density memory foam on top of individually pocketed coils. The combination offers the best features of both. Memory foam provides great pressure relief, conformity and reduced motion transference. The coils offer support and conformity as only a spring system can. Tomorrow Sleep is backed by Serta Simmons, the world's largest mattress company. Medium Soft and Medium Firm are both equally supportive. Different foam densities create alternative comfort feels; with either option, the cover and underlying support system are the same. A thin​, breathable blend of stretchy polyester and nylon fits loosely across the surface of the mattress. It’s imperative it fits this way to allow the memory foam and coils to conform easier and perform better. The cover is soft and breathable with a grooved swirl pattern. 6″ of pocketed 800 Series high-carbon steel coil (.083″ wire.) Unlike traditional bonnell coil units, these springs function independently of each-other. This creates greater body conformity and lessens motion transfer. This is great for couples who worry about disturbing their sleep partner. The coils also allow better air passage keeping you cool and comfortable. 1″ base foam layer which the coils rest upon. This foam offers additional stability and support. 1/2″ 2.5 lb. /cf Airy Comfort Foam Layer with Gel. 1.5″ 2.6 lb./cf Dynamic Response Foam Layer. Original memory foams slept much warmer. Modern innovations like Phase Change, have been game changers. Get all the benefits of memory foam without sleeping hot. Airy comfort foam layer with gel provides additional pressure relief and has advanced cooling attributes. A dynamic response foam layer adds bounce and buoyancy while reducing sinkage. 2″ 2.5 lb. /cf Airy Comfort foam Layer with Gel. Viscoelastic (Memory Foam) with PCM (Phase Change Material) has the same great cooling qualities. But this layer is softer and more conforming. Ideal for side sleepers seeking more contouring for the shoulders and hips. Comfort foam Layer with Gel eliminates past issues of heat retention issues. A thicker layer of this softer foam creates a plusher, more luxurious feel. Greater contouring is achieved for those seeking a more forgiving sleep surface. Tomorrow Sleep asked us to try their entire line of accessories with their mattress including the insightful Sleeptracker. Tomorrow Sleep’s Memory Foam Pillow is designed to have both a cool side and a warm side. The difference was slight, but certainly discernible. The pillow is soft and conforming. 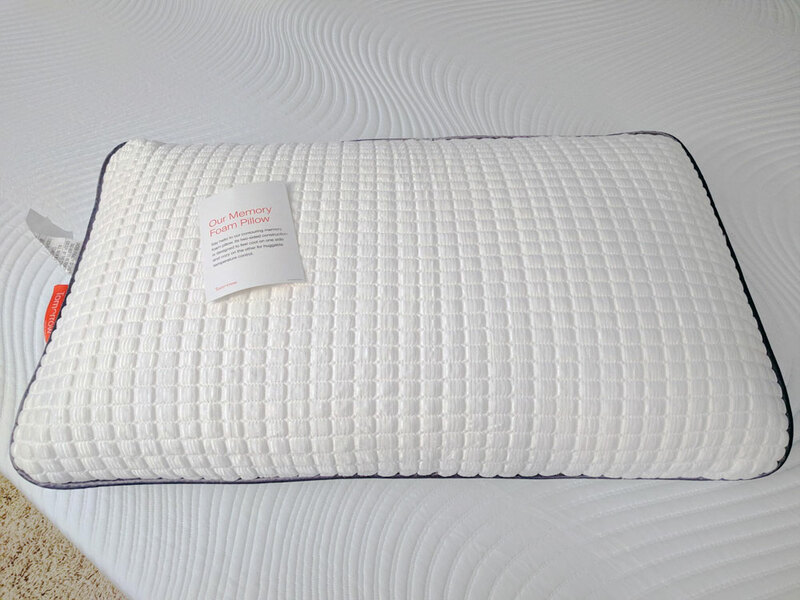 Some memory foam pillows we’ve tried have felt a bit too firm to provide pressure relief but, this has a really nice feel. This pillow has just the right blend of comfort and support. It felt especially nice while on our backs. Side sleeping it could have been a bit thicker but, that’s more of a personal preference. We noticed no unpleasant odors that sometimes accompany memory foam pillows. Overall, we feel this is a high quality pillow. The Plush is a cushy, hypoallergenic down alternative. It’s a bit thicker than the memory foam option and felt great while sleeping on my side. There is ongoing debates about how hypoallergenic down actually is. Simply put, if you have a known allergy but like the down feel, Tomorrow Sleep’s Plush pillow is a great alternative. We found this pillow quite soft and conforming. It felt the most comfortable while sleeping on our sides. On our backs we preferred the memory foam due to the lower height. Of course, That is just a personal preference. Tomorrow sheets are made from U.S. grown cotton. Percale woven, these 500 thread count linens are a breathable two sided weave that resists pilling. Some of the reviews describe the material as being a bit too crisp feeling. Quite frankly, we found them very soft to the touch. We did however, wash them prior to use. A Percale weave will soften a bit more with each wash. Tomorrow sheets are fitted for no-slip comfort. Lightweight and breathable, they are designed to keep you sleeping cool and comfortable. 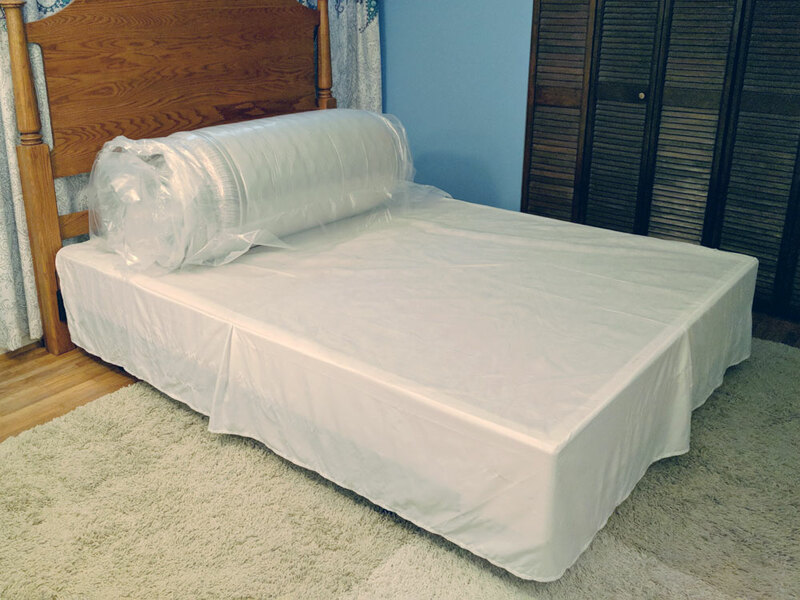 A mattress protector should first and foremost, protect the mattress. A stain on your bed will generally void all warranty claims. Waterproof covers are best for this purpose but choosing a quality protector is important. Poor quality covers retain heat and often feel crinkly under your sheets. Tomorrow Sleep’s mattress protector is made with Instacool. This specially designed fabric draws heat away from your body. The cover is thin and barely noticeable. A good mattress protector should do its job without changing the feel of your mattress. We highly recommend this cover. The Tomorrow Sleep Comforter is a 300 thread count fabric filled with ThermoBall. This down-alternative filling is hypoallergenic and ideal for allergy sufferers. Wrapped in percale weave it offers an airy, yet crisp feel. The overall appearance of this comforter is plush and luxurious. At the same time, it offers a clean delicate look that is quite appealing. Considering how lightweight the material is, it feels warm and welcoming. When we first heard about Tomorrow Sleep’s Sleep Tracker device, we could not help but draw comparisons to Fitbit. We decided to use both during our evaluation. There were some concerns about the sensors being so far away from your body. Would that affect how accurate the readings would be? 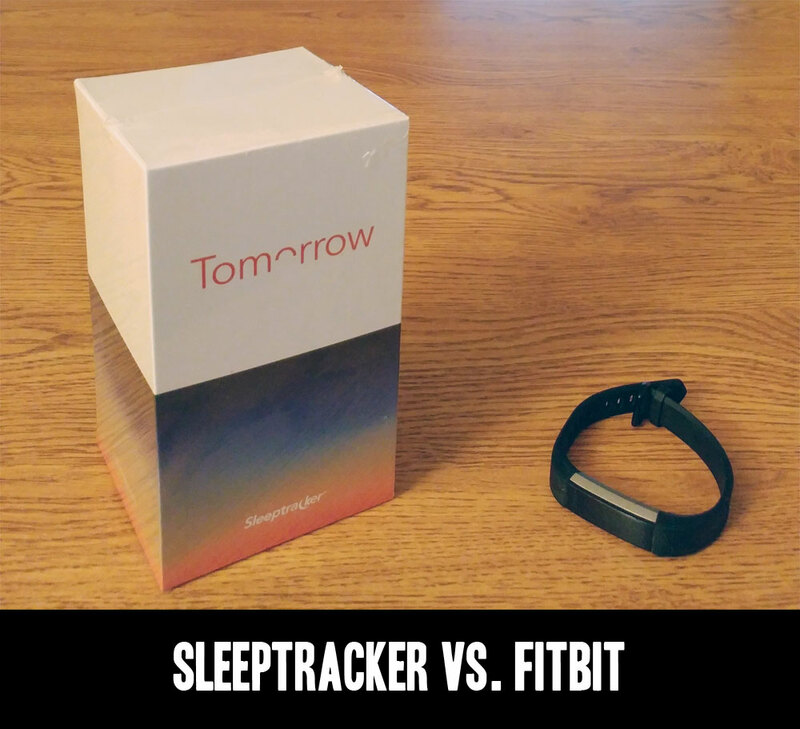 What we found was little or no difference between Sleeptracker and Fitbit readings. We were was also very surprised to see that Sleeptracker offers even more features. 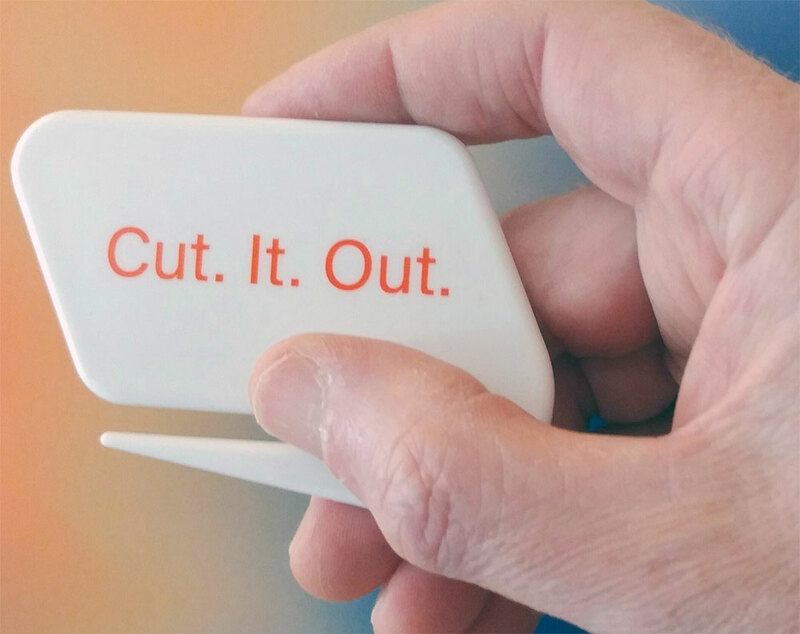 This device monitors both heart and breath rates. An added bonus is not having to wear it on your wrist while sleeping. The Sleeptracker stays plugged in so there’s nothing to charge. Once setup is complete, you will receive a daily sleep analysis. You’ll be able to set goals and monitor your progress. We found the Sleeptracker to perform exceptionally well! *Average heart rate is monitored but not specific to sleep duration. When you open up your Sleeptracker box, you’ll notice that there are few parts to plug together. It seems pretty simple but you won’t find a whole lot of instructions in the box. No worries, when you install the Sleeptracker app, you will be prompted to follow a series of instructions and watch a short video. It’s a little time consuming but, nothing particularly complicated. Once setup is complete, your first actual report takes a little while to process. They actually let you know this in advance. Our first results came by mid afternoon the following day. Since then, we’ve received regular morning updates. The above photo shows proper position of the sensors if monitoring couple’s sleep. Tomorrow Sleep’s hybrid offers solid support. Its coil system is not as substantial as Serta’s Icomfort / Blue Fusion line up. That said, proportionate to the price paid, it’s a premium value. Dense foams provide decent body contouring comfort. This is a strong suit for Tomorrow’s hybrid. The combination of individually pocketed coils and memory foam allow for pressure relieving conformity. We found the soft mattress to be exceptional for side sleeping. Motion transfer is limited with the Tomorrow Sleep Hybrid. We noticed little to no sleep disturbance. In this regard, it felt very much like sleeping on a spring free mattress. Movement on the hybrid was easier than a typical memory foam mattress. A quality innerspring unit will do that for you. Replacing the polyurethane cores commonly found supporting memory foam with pocketed coils makes a difference. It offers more push back and less sinkage. The Hybrid sleeps cooler than your usual memory foam beds. Tempurpedic may have been the first to popularize memory foam, but Serta revolutionized cooling technology. Phase Change and gel foams alleviate most issues with heat retention. Tomorrow’s pocketed coils also allows for better air flow and even more temperature regulating. Upon unpackaging the Tomorrow Sleep Hybrid, we noticed only a mild, inoffensive, new scent. What little odor was discernible quickly dissipated. All Tomorrow Sleep foams are CertiPUR certified to not emit dangerous chemicals into the air. Based on it’s specifications,Tomorrow Sleep should prove to be quite durable. This mattress should provide many years of support and comfort. While not as solid as some of the Quantum Edge coils we’ve seen, Tomorrow Sleep performs reasonably well in this category. When rating mattresses for this or any other criteria, we compare to similar priced products. Tomorrow Sleep measures up well against other brands in the under $1,000 range. Tomorrow Sleep has joined a small number of mattress companies to offer a 365 day comfort trial. This is designed to effectively remove any reservations you may have about making a purchase. It’s unlikely most people will require that long to make a decision. Having that choice adds considerable peace of mind. Tomorrow’s 10 year warranty meets the accepted industry standard for quality bedding. There are a few companies that boast longer, but we would consider this a solid warranty. Shipping is free to your door in the continental U.S. Tomorrow Sleep does offer a white glove delivery that includes in home delivery and set up. The fee for this service varies on your location but may be worth it. A queen mattress weighs just over one hundred pounds and generally requires 2 sets of hands. However, if you do have assistance available, setup is actually pretty simple. Tomorrow Sleep’s memory foam hybrid offers greater mobility than it’s all foam counter parts. While not providing as much bounce as latex, movement is much easier than spring-less memory foam. Tomorrow Sleep’s exceeded our expectation for a mattress at this low of a price. Quality support and comfort make this mattress a great value. The difference from firm to soft comfort feel results from varying foam densities. Comfort feel does not affect support. For years, many consumers have purchased beds that were too firm under the false premise that more rigid, means better support. Both proper alignment and comfort are equally important. You don’t have to sacrifice one for the other. A Medium firm is sometimes called luxury firm or cushion firm. It’s designed to address the widest range of comfort preferences. Firm, but with enough pressure relief for most back, stomach and a large portion of side sleepers. Many companies use this designation, but no two make a feel that is exactly the same. While some tend to be a bit softer or firmer, Tomorrow Sleep’s medium firm stays true to that mid range comfort feel. This particular firmness level is popular with many couples who have different comfort preferences. It’s a nice compromise option. The medium soft is designed for those sleepers who appreciate more contouring body hug and softness. Many people confuse firmness with support. The difference between the medium soft and medium firm is comfort; not support. It’s a personal preference, not a right or wrong senario. Most back sleepers tend to appreciate a bit firmer feel. That said, nobody’s body is perfectly flat. Having a little bit of conformity prevents putting too much pressure on your shoulders, hips and elbows. This makes the medium firm an ideal choice for back sleepers. During our trial, the medium firm felt quite comfortable while on or backs. It provided solid spinal alignment without creating pressure points. This is where the Tomorrow Sleep’s medium soft hybrid shines. We found this mattress to be extremely comfortable for side sleeping. It provides extra body hug for the shoulders and hips creates a floating sensation. The medium soft is one of the more pressure relieving mattresses we have tried. While on or sides we found the medium firm’s pressure relief to be adequate; but not nearly as much contouring as the medium soft. It did not provide the kind of body hug many side sleepers appreciate. Of course, comfort is subjective. It’s important to note, no two people interpret comfort exactly the same. Even some side sleepers prefer a firmer feel. Typically, larger individuals will sink further into a mattress and have a different impression of how firm a bed is. In this case, the medium firm may be the way to go. For most side sleepers however, the medium soft will be the safest bet and have the widest appeal. The medium firm for us was the clear choice for stomach sleepers. It’s firm enough to prevent your lower back from dipping and causing lumbar pain. At the same time, not so firm to add pressure points.The medium soft will be too soft for most who predominantly sleep on their stomach. A true quality hybrid mattress priced well below retail store competitors. Individually pocketed coils reduce motion transfer. Couples feel their partner's movements less which promotes more restful nights. 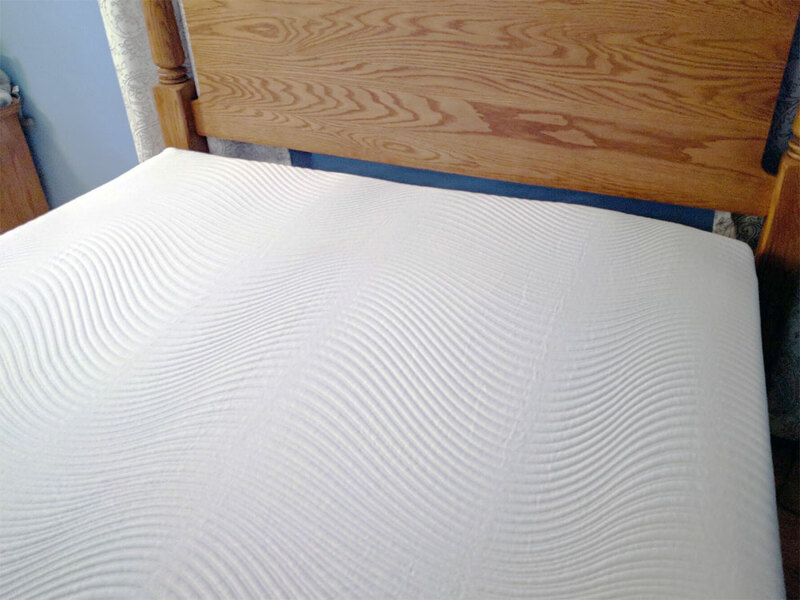 High density memory foam reduces pressure points and limits motion detection. Sleeps cool: phase change material and gel memory foam reduces heat retention. Tomorrow Sleep is backed by Serta Simmons, the largest name in the bedding industry. 365 Night Comfort Guarantee: Take a full year to decide if Tomorrow Sleep is right for you. It’s heavy: A standard queen mattress weighs over 100 lbs. While this does speak to the quality of the construction it will need two sets of hands to bring into your home. If assistance is not available, we recommend inquiring about Tomorrow Sleep's White Glove Delivery service. Edge support: Although adequate, there are competitors with more substantial edge support. However, expect to move into some higher price points to do so. You’ll like Tomorrow Sleep if you’re in search of excellent pressure relief. Tomorrow’s memory foam and pocketed coils allow for superior body contouring. If you like the feel of memory foam but are concerned it will sleep too hot, the Tomorrow Sleep hybrid might be for you. Phase change materials and gel memory foam sleep cooler than traditional memory foam. If you want pressure relief but still like the support feel of a coil mattress, you should consider this bed. Tomorrow Sleep strikes a nice blend of the best qualities of both technologies. Couples seeking limited sleep disturbance will appreciate the Tomorrow Sleep’s low motion transfer. We found this mattress performed very well in this category. If you prefer the feel of a spring free foam bed, this might not be the mattress for you. Although pressure relieving, the hybrid has a more structured feel. People who love a spring-less memory foam should consider the newly released Tomorrow Sleep Memory Foam mattress. Being careful not to damage the fabric, carefully cut through the plastic wrapping. Once the vacuum seal is broken, you will hear the sound of air passing quickly into your mattress. Within minutes, your Tomorrow Sleep mattress will take shape. Although you can lay down on your bed right away, the mattress will fully expand in a few hours. Note: It’s essential with a queen or king size mattress to have a frame with a sturdy center support and additional legs on the ground. Over time, inferior frames can affect the support and longevity of your mattress. 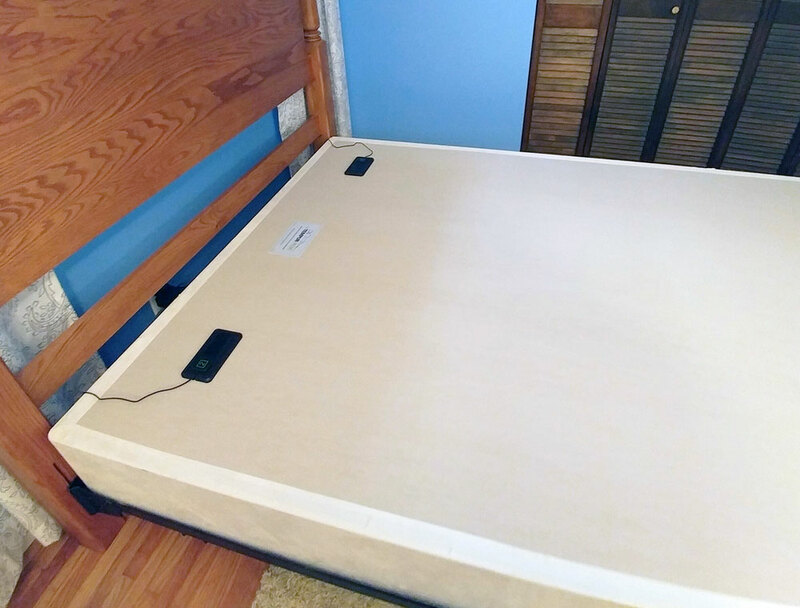 When we heard Serta Simmons had manufactured this bed we had high expectations. Tomorrow Sleep did not disappoint. In fact, the mattress exceeded anything we had anticipated.